The sport of "skating" can be broken into three categories: roller skating, inline skating, and ice skating. CBC News. Tuesday, 16 Apr 2019 07:00:00 EDT. A former hockey player who went into cardiac arrest before a minor league game two years ago began skating again with a prosthetic, a video posted Thursday on social media showed. Ryan Gaydos. Fox News. Tuesday, 09 Apr 2019 15:16:11 GMT. 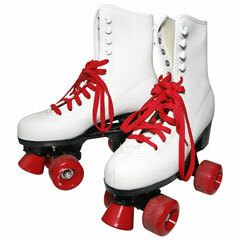 Roller skating involves gliding over a smooth surface on roller skates, which are specially designed boots with two wheels at the front and two at the heel. Roller skating can be enjoyed outdoors or at indoor roller rinks. During the late 1980s and early 1990s, roller skating lost some of its appeal as in-line skates became popular. In the early 18th century, a Dutchman named Joseph Merlin came up with the idea of attaching wooden spools to a plate to simulate ice skating on dry ground. 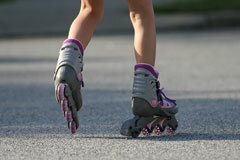 In 1763, the first roller skates were created, featuring metal wheels. In 1863, American inventor James Leonard Plimpton patented the first roller skates that enabled the wearer to move about more smoothly by shifting weight. 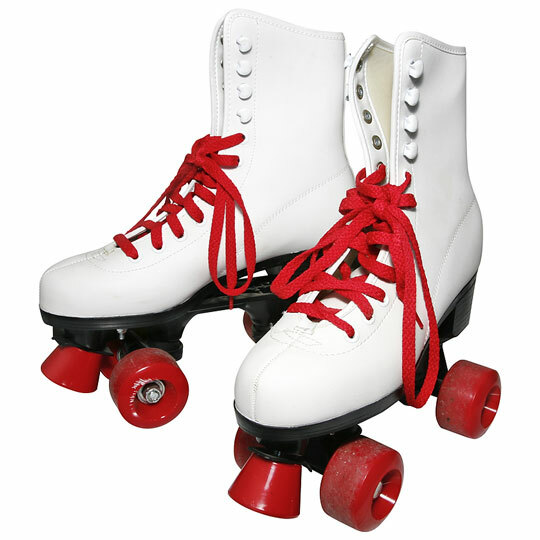 Roller skates with ball-bearing wheels took over several decades later, and vaudeville acts often made use of these skates. Plastic polyurethane wheels were introduced in the 1970s; these wheels allowed for easier maneuvering, increasing the sport's popularity. Roller skating competition has included artistic skating, speed skating, roller hockey, and roller derby. Artistic skating shares similarities with figure skating, and can be performed with or without a partner. Speed skaters race through a course, competing against each other and the clock. Roller hockey utilizes rules similar to ice hockey. Roller derby, which died out in the 1970s, was a contact sport involving teams racing around a track. During the 1990s, inline skaters began competing in derby events. Inline skating is a popular recreational activity where the skater glides on lightweight boots with three to five wheels attached in a line. Scott Olsen is the American entrepreneur credited with developing the first modern in-line skates as a way to train for ice hockey during the off-season. These skates were comprised of a metal frame, urethane wheels, and a heel brake. Olsen later founded Rollerblade, Inc., producing in-line skates for general recreation. The sport has evolved, and there are currently more than 30 in-line skating companies. Skaters use a technique called striding, which is balancing on one foot while pushing off with the other. This is repeated with the opposite foot. To stop, skaters can use the heel brake (a rubber pad attached to the back of the skate), the t-stop (dragging one foot behind the body perpendicular to the other foot), or the powerslide (an abrupt turn). Stunts and tricks such as grinding, curb launching, and vert skating are used by advanced skaters during aggressive skating, otherwise known as street skating. Grinding involves riding curbs, rails, and similar objects. Curb launches involve jumps off elevated surfaces. Vert skating is short for vertical skating and involves stunts in a half-pipe structure. Skate parks may have launch ramps and obstacles such as curbs, rails, and stairs for performing advanced tricks in an enclosed area. All riders, especially those performing these advanced stunts, should wear protective gear such as wrist and elbow pads, knee pads, and a helmet. Most in-line skates weigh between 4 and 7 pounds. The boot is made of a hard plastic shell with laces and or buckles over a boot liner. On the bottom of each boot is a wheel frame housing three to five urethane wheels in vertical placement from heel to toe. Large wheels are more stable at high speeds, and they range from 76 to 80 mm in diameter. Smaller wheels allow for added maneuverability and measure from 70 to 72 mm in diameter. Many skaters participate in in-line competitions, which include racing, aggressive skating, and roller hockey. In-line racing can be an individual or team pursuit, and is held on circuits from 1 to 50km in length. Skaters may compete in slalom runs, where two skaters race an obstacle course simultaneously. Most aggressive skating competitions are sponsored by the Aggressive Skater's Association; these competitions are held in skate parks around the world. Skaters compete in two 60 second or 90 second runs, combining moves on rails, ramps, and half pipes with free form skating tricks. Roller hockey rules are similar to those of ice hockey, with less physical contact. Roller hockey utilizes a ball instead of a puck. Amateur and professional roller hockey leagues have been overseen by Roller Hockey International and USA - Inline Hockey. In the sport of ice skating, skaters glide across ice on ice skates; special boots attached to steel runners. 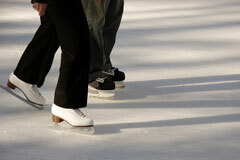 Ice skating may be performed in indoor or outdoor rinks, and on frozen lakes, ponds, rivers, or streams. The sport is most prevalent in countries with long, cold winters, although the indoor rinks have made ice skating popular in warmer areas as well. Competitive ice skating is comprised of figure skating and speed skating. Figure skating involves athleticism and artistry. It involves complex jumps, such as the axel, salchow, lutz, and loop jump. The axel was invented by a Norwegian speed skater named Axel Paulson. It involves launching a jump from the left forward outside edge of the skate, making one full rotation in the air and landing traveling backward on the right backward outside edge of the skate. Double and triple axels involve two and three rotations, respectively. The salchow was named after Swedish skater Ulrich Salchow. To perform this maneuver, the skater takes off from the back inside edge of the skate while traveling backward, makes a rotation, and lands on the back outside edge of the second skate. Double and triple salchows are extremely advanced moves. The lutz was invented by an Austrian skater named Alois Lutz. It is similar to the salchow, except the skater travels on the outside edge and uses the toe of the opposite foot to launch the jump. Double and triple lutzes are also used in competition. Loop jumps are started on the right back outside edge and finish on the same edge. Spins are figure skating maneuvers which are centered on a single spot. The upright spin, the sit spin, and the camel spin are basic competition spins. When the skater stands and rotates, it is referred to as an upright spin. A sit spin involves spinning in a sitting position with one leg extended in front. Camel spins involve the skater extending one leg behind and extending the arms forward. International competition for figure and speed skating is governed by the International Skating Union (ISU), and involves The World Championships and Winter Olympic Games. Figure skating events include individual men's and woman's competition, pairs skating, ice dancing, and precision skating. Costumes are chosen to reflect the theme of the routine or the mood of the music. Figure skating boots are made of leather extending above the ankle and have 1.5 inch heels. The blades are steel, a few millimeters wide, and slightly curved on the bottom. They have toe picks to assist in jumps and spins. Speed skating events may be short sprints or longer distances. Skaters use their arms to propel them in a sprint. In a distance event, the arms are kept behind the body to conserve energy. In mid-distance events, skaters alternate between these techniques. Speed skates are lightweight and utilize thin flat blades, ensuring smooth continuous motion across the ice. The leather boots are short with no ankle support. Speed skaters wear tight body suits to cut down on wind resistance.